Does Your Vehicle Need Tire Service? One of the most obvious signs that your vehicle needs tire service is tire wear. You’ll want to pay attention to how your tires are wearing – is one or more tires worn down more than the others? Is it worn more on one side of the tire than the other side? These are indications there may be a problem with your suspension system, alignment, or even just underinflation. Our technicians have the latest tools to help diagnose the cause of uneven tire wear. We will also make sure to check the depth of your tire tread as well.Many use the “penny” test to determine whether or not they need to purchase new tires. Place a penny head first into several tread grooves across the tire. If you always see the top of Lincoln’s head, your treads are shallow and worn, and you need to replace your tires. The experts at USA Automotive can assess and correct any misalignment or suspension problems and recommend new tires if needed. Tires are one of the most important safety features of any vehicle. After all, they are the only contact your vehicle has with the road so you will want to make sure they have full contact. Over time, tires will experience wear and need to be replaced. 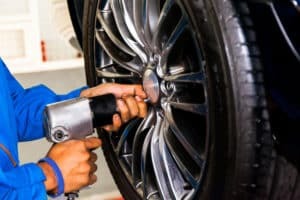 When it comes to replacing your tires you should purchase the proper size that the manufacture installed on the vehicle originally or you may experience problems with handling and excessive wear. Our tire experts will help determine the best tire for your vehicle based on your driving patterns and specific needs. Even if you are not concerned with wear, it is important to remember that tires will “dry rot” over a period of time and it is recommended to replace tires every 6 years. (There is a DOT # on the sidewall of the tire that states the month and year the tire was made). At USA Automotive, you can choose from major brands of tires like BFGoodrich, Toyo, Dunlop, Firestone, Goodyear and Michelin, to name just a few. We also sell wheels and tires for custom, performance and luxury vehicles. Schedule Your Tire Service Today! 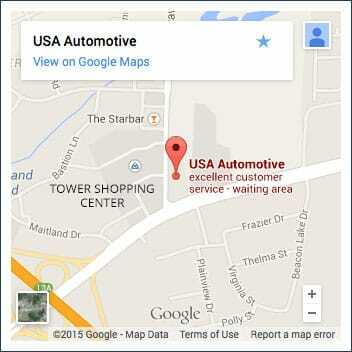 At USA Automotive, we are dedicated to providing your vehicle quality tire service and tire replacement when needed. Your tires are your lifeline to getting where you need to go safely, and it is our responsibility to make sure you and your vehicle are prepared for the roads ahead. Whether your tires need to rotated or balanced, or you need a new set of tires, our team will provide you with a stress-free experience. Give us a call today at 919-249-5295 or make an appointment request online. We look forward to the opportunity to provide you with the best tire service that Raleigh has to offer!